Imitation is the sincerest form of flattery in professional wrestling. But let’s be real, there are certain moves that wrestlers just shouldn’t do. Over the years, a particular wrestler has perfected a move with such crisp efficiency that no one will ever come close to mirroring its execution. 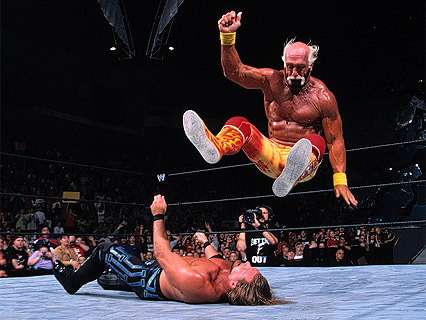 There are five moves on my list that wrestlers should stay away from because it will never be done as well as their predecessor who brought it into the limelight. Jake ‘The Snake’ Roberts’ DDT: It was once one of the most popular finishing maneuvers of all time and now it is used as just another move. Raven, Mick Foley, Randy Orton and others have used the DDT in their arsenal but none pulled it off with more effectiveness than Jake Roberts. The move was also portrayed as one of the most feared by many heels in the 1980’s and 90’s. Fans chanted “DDT”, DDT” as Robert’s called for Damien’s Dinner Time. The Miz might be able to prove me wrong on this one though. Taz’s T-Bone Suplex: Taz ran rough shot through ECW and choked out everyone in his path. 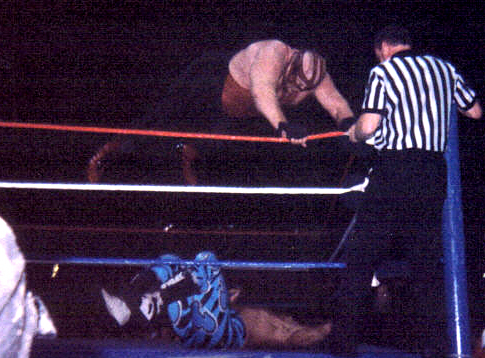 The move he most often used to set up the Tazmission was a Taz-Plex aka T-Bone Suplex. Taz was able to bridge effectively when throwing his wide array of suplexes and, it looked like it hurt. Others such as Shelton Benjamin and recently, Brodus Clay use the T-Bone but it just doesn’t look right. I’m all for artist inter-operation but it looks like a half-assed fall away slam when anyone else does it. 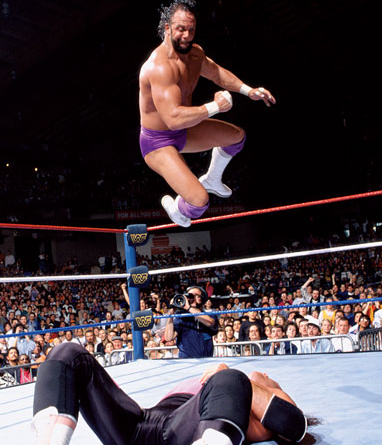 Macho Man Randy Savage’s Flying Elbow Drop: I think you all know where I’m going with this. CM Punk and that hideous excuse for a top rope elbow. I realize he is doing it in tribute to a legend but a couple of times would have sufficed. Now, the elbow is a part of his regular rotation of moves. It looks like he is going to wipe out when he leaps off the turnbuckle and the actual elbow connects less than the people’s elbow ever did. Bret Hart’s Sharpshooter: The Rock needs to stop doing the Sharpshooter ASAP. He often forgets how to apply the move and it screams “Wrestling is Fake” when he executes the hold. Sting’s application of the move is suspect too. He often doesn’t sink down all the way and sit down on the back and I just sit there wondering how anyone is supposed to believe a wrestler can’t escape the dreaded Scorpion Death Lock. Sting did it first but the move was made famous by Bret Hart. It looked like it really hurt when Hart applied the hold and he protected the move by having very few people escape his grip. Vader Bomb: Jack Swagger lands with it too lightly and Big Show looks like Homer Simpson falling down the stairs when doing this move. Vader crushed some of the best in the business with this move. His appearance on Raw a few weeks back against Heath Slater was a refreshing reminder of how good this move is done when it’s Vader Time! Jake the Snake was the man, but enjoyed Raven using the DDT to blind people in the WCW back in the day :).